It’s been a great year for Sales Navigator so far, and our Q4 Quarterly Product Release is the biggest yet. Earlier this year we rolled out capabilities to broaden Sales Navigator as a platform (SNAP), and make Sales Navigator more useful to reps closing opportunities using Deals. We redesigned our lead, account and advanced search experiences on desktop and mobile, and integrated Sales Navigator into Office 365. We also made sure Sales Navigator was ready for GDPR, and obtained even more security certifications. But what we’re releasing today has me even more excited because we’re making it easier than ever to get the most out of Sales Navigator. That’s because four major features of this release — Alerts, custom Lists, “reports to” and mobile Advanced Search — are available for all Sales Navigator users, which will make Sales Navigator more valuable to you and everyone on your team. There’s a new icon in town. Alerts are now part of the main menu bar in both desktop and mobile versions of Sales Navigator, and more useful as well. Think of our Alerts as a trusted sales advisor tapping you on the shoulder with information about your saved leads and accounts when it’s most important and relevant to you. You already rely on lists to keep track of your Saved Leads and Accounts. Now you can make unlimited, customized lists in desktop and mobile versions of Sales Navigator. That means custom lists are at your fingertips at your desk or on-the-go, whether you’re planning for the quarter or out meeting prospects at a trade show. 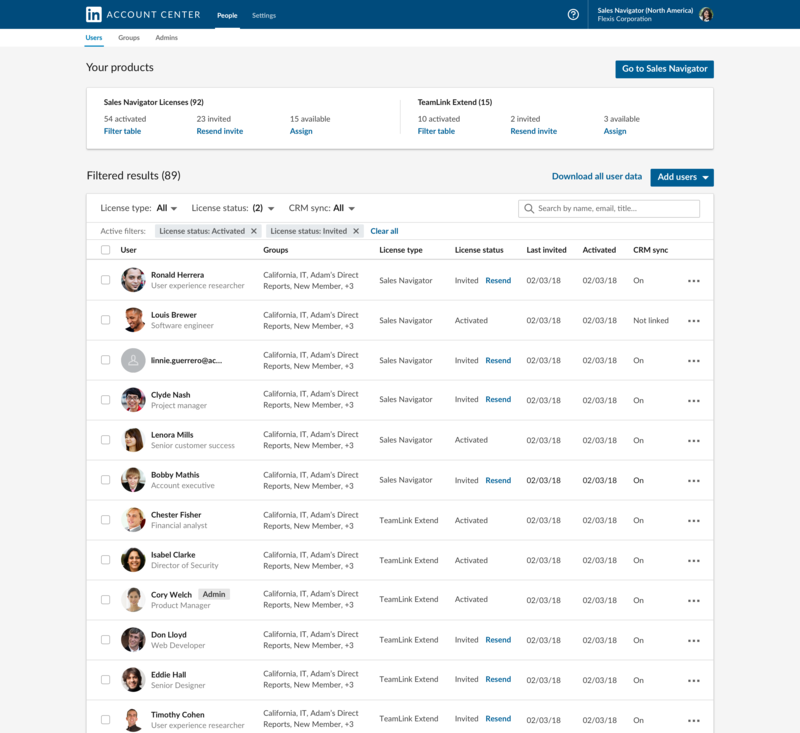 The new custom Lists view lets you easily jot down notes on a Saved Lead or Account and filter your list based on groups like people who have changed jobs in the last 90 days, people who have posted on LinkedIn in the past 30 days, or companies who have had senior leadership changes in the past 3 months, among others. We’re laying the foundation for full-blown org charts by adding a new “Reports To” field on the Lead Page. Once you learn who someone’s manager is, you can add that info to their page by searching for a name or browsing our recommendations. Any additions you or your colleagues make will only appear to those in your company’s Sales Navigator contract. So, the next time you or a team member looks that lead up, you’ll see who they report to, who added that connection, and a reporting history. Admins, we just made things simpler for you, too. We completely redesigned the admin experience and made it much easier to do tasks from assigning users to managing groups. 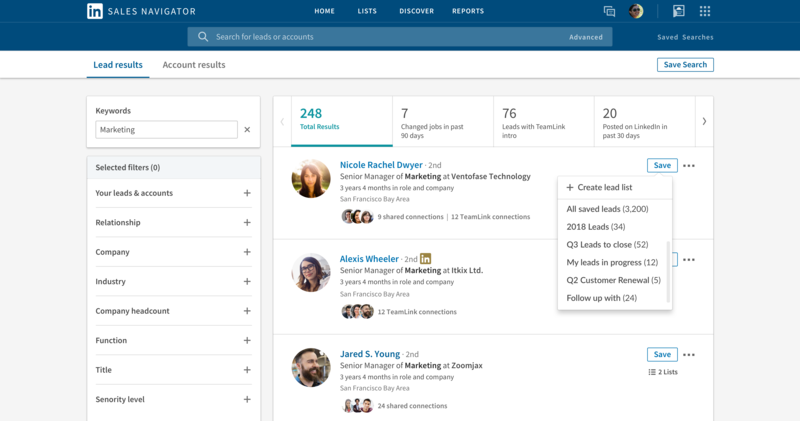 Better yet, we’ve rolled out the Account Center as a LinkedIn platform — if you’re an admin for Sales Navigator and other LinkedIn enterprise products like LinkedIn Learning or Recruiter, you can manage your seats from one place. With every release this year, we’ve beefed up the Sales Navigator experience on mobile — and search is a core part of that experience. This quarter we’re bringing all of the desktop search features to the Sales Navigator mobile app. No matter when or where you’re using Sales Navigator, you can apply advanced filters to your searches, see search history and save your searches across devices. PointDrive is a great way to share sales materials and track who is engaging with them, but to-date all that tracking happened in Sales Navigator. 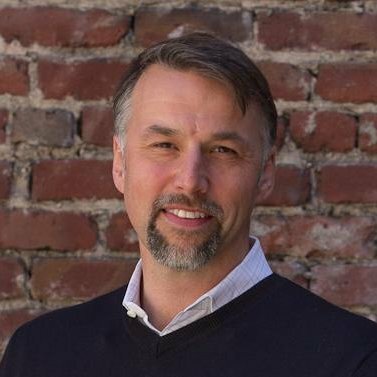 Now we’re writing PointDrive engagement activities back to Dynamics 365 for Sales (and Salesforce in 2019). So, when a prospect views a PointDrive, that activity is automatically logged to their CRM record. Now when you send that pricing proposal to a prospect in PointDrive and members of the buying committee engage with it, you’ll be able to see that activity in both Sales Navigator and your CRM. This quarter we’re launching a new SNAP partner category, Web Conferencing, and integrating with Zoom as our first partner. 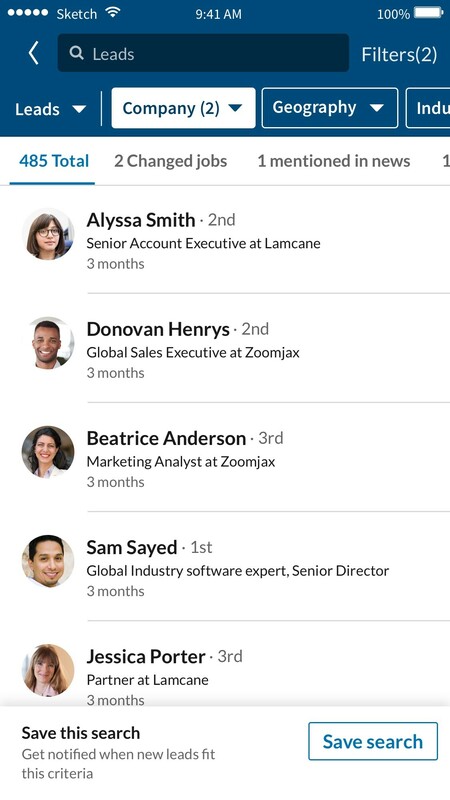 The Zoom integration will let you hover over the name of anyone in the list of of people on a Zoom call and see their Sales Navigator information (e.g. profile photo, title, things you have in common). It’s a very cool, on-the-fly way to know more about meeting attendees, and any connections you might have in common. We’re also deepening our relationship with Salesforce by tightly integrating with the Winter Lightning release so administrators can configure Sales Navigator without having to go to AppExchange, as well as adding support for Person accounts in both Classic and Lightning. Thank you for all your support of Sales Navigator, and for making 2018 a great year. 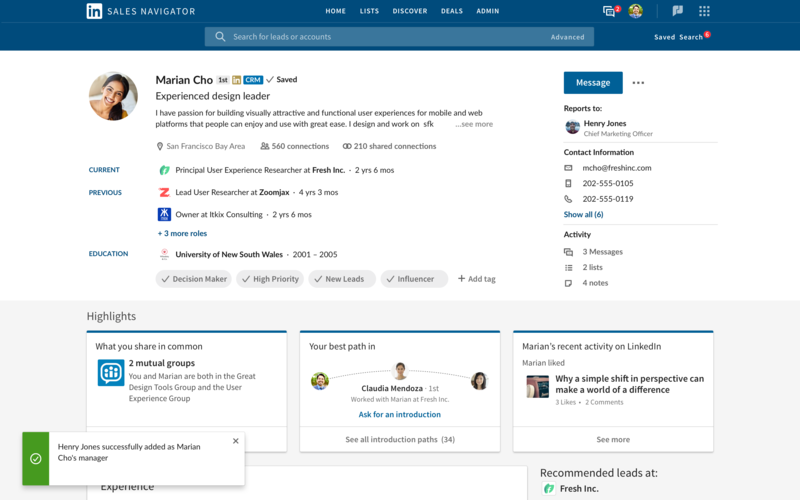 *Note that engagement Alerts for your company’s organic LinkedIn posts will be available for Team and Enterprise Edition customers, while alerts for your company’s sponsored LinkedIn posts will only be available in Enterprise Edition.